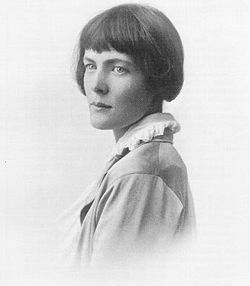 Hilda Doolittle (September 10, 1886 – September 27, 1961), prominently known only by her initials H.D., was an American poet, novelist, and memoirist. She is best known today for her poetry, and particularly her work written in close association with the Imagist movement of Ezra Pound. H.D. 's early poetry, with its bare, almost primitive language and concise style, is often considered to be the quintessential work of the Imagist movement. Her work from this period is also considered to include some of the earliest and most radical examples of free verse that had been written in English up to that time. These early works of H.D. influenced a number of other Modernist poets, most notably Marianne Moore, William Carlos Williams, and Pound himself, who would borrow her stripped-down style and use it to great effect for his epic work, The Cantos. H.D. would eventually distance herself from Imagism, ultimately disregarding her work from that period as a series of failed experiments. Although her style would remain spartan and compact, her later works embrace H.D. 's prolific reading of the Latin and Greek classics, and in particular the works of Sappho. In addition to this, H.D. would attempt to develop a uniquely feminine style of poetry, and she devoted a large portion of the remainder of her life to the composition of her "feminist epic" Helen in Egypt, a retelling of the classic legend of the Iliad from the perspective of its female instigator, Helen of Troy. Her works were sadly ignored for most of her life following her break from Imagism, and it has not been until recent decades that her important role in the development of Modernism has been fully recognized. If Pound was the primary voice of Modernism, H.D. was its primary muse; her influence on the development of twentieth century American poetry should not be underestimated. Hilda Doolittle was born in Bethlehem, Pennsylvania, in Pennsylvania's Lehigh Valley. Her father, Charles Doolittle, was professor of astronomy at Lehigh University and her mother, Helen (Wolle), was a Moravian with a strong interest in music. In 1895, Charles Doolittle was appointed Flower Professor of Astronomy at the University of Pennsylvania, and the family moved to a house in Upper Darby, an affluent Philadelphia suburb. Doolittle attended Philadelphia's Friends Central High School, located at Fifteenth and Race streets, graduating in 1903. A year earlier, she met and befriended Ezra Pound, who was to play a major role both in her private life and her emergence as a writer. In 1905, he presented her with a sheaf of love poems with the collective title, Hilda's Book. That same year, Doolittle attended Bryn Mawr College to study Greek literature, but she left after three terms because of bad grades and poor health. While at the college, she met the poets Marianne Moore and William Carlos Williams. Her first published writings, some stories for children, were published in a local church paper between 1909 and 1913, mostly under the name Edith Gray. In 1907, she became engaged to Pound. Her father disapproved of Pound, and by the time her father left for Europe in 1908, the engagement had been called off. After spending part of 1910 living in New York City's Greenwich Village, H.D. sailed to Europe in 1911. Pound had already moved to London, where he had started meeting with other poets at the Eiffel Tower restaurant in Soho to discuss plans to reform contemporary poetry through free verse, spare language, and the utilization of East Asian poetic forms such as haiku. Soon after H.D. arrived in England, she showed Pound some poems she had written. He was impressed by their closeness to the ideas he had been discussing and introduced her and another poet, Richard Aldington, to the group. 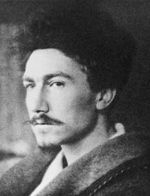 Ezra Pound was H.D. 's fiancé for a time and created the pen name H.D. Imagiste for her early work. In 1912, during a meeting with H.D. in the British Museum tea room, Pound appended the signature H.D. Imagiste to her poetry, creating a label that was to stick to the poet for most of her writing life. That same year, Harriet Monroe started her Poetry magazine and asked Pound to act as foreign editor. In October, he submitted three poems each by H.D. and Aldington under the rubric Imagiste. Aldington's poems were in the November issue of Poetry and H.D. 's poems, "Hermes of the Ways," "Orchard," and "Epigram," in the January 1913 issue. Imagism as a movement was launched with H.D. as its prime exponent. Although the early models for the imagist group were Japanese, H.D. derived her way of making poems from her reading of Classical Greek literature and especially the recently rediscovered works of Sappho, an interest she shared with Aldington and Pound, each of whom produced versions of the Greek poet's work. In 1915, H.D. and Aldington launched the Poets' Translation Series, pamphlets of translations from lesser-known Greek and Latin classics. In total, H.D. published three volumes of translations from the Greek: Choruses from the Iphigeneia in Aulis (1916), Choruses from the Iphigenia in Aulis and the Hippolytus of Euripides (1919), and Euripides' Ion (1937), and an original play based on Greek models called Hippolytus Temporizes (1927). H.D. continued her association with the group until the final issue of the Some Imagist Poets anthology in 1917. She and Aldington did most of the editorial work on the 1915 anthology. Her work also appeared in Aldington's Imagist Anthology 1930. All of her poetry up to the end of the 1930s was written in an Imagist mode, with a spare use of language, a rhetorical structure based on metonymy—that is, a description of things as they are—rather than through simile, metaphor, or symbolism. This style of writing was not without its critics. In a special Imagist issue of The Egoist magazine in May 1915, the poet and critic Harold Monro called H.D. 's early work "petty poetry," denoting "either poverty of imagination or needlessly excessive restraint." H.D. married Aldington in 1913. Their first and only child together, a daughter, died at birth in 1915. Aldington and she became estranged after he reportedly took a mistress. Shortly after this, Aldington answered the national call to serve in the army, and H.D. became involved in a close but, from all reports, platonic relationship with D.H. Lawrence. In 1916, her first book, Sea Garden, appeared and she became assistant editor of The Egoist, taking over from her husband. In 1918, her brother Gilbert, a soldier, was killed in action. H.D. moved in with a friend of Lawrence's, named Cecil Gray, and became pregnant with his child. When Aldington returned from active service he was not the same man, changed by war, and he and H.D. formally separated. Toward the end of the war, in 1918, H.D. had met British writer Bryher (Annie Winifred Ellerman), who was to become and remain her companion for the rest of her life. They lived together until 1946. In 1919, H.D. 's daughter, Frances Perdita Aldington (although the father was not Aldington, but Gray), was born, after H.D. had survived a serious bout of influenza. Her father, who had never recovered from Gilbert's death, died himself. At this time, H.D. wrote one of her very few known statements on poetics, Notes on Thought and Vision (published in 1982). In this, she speaks of poets (herself included) as belonging to a kind of elite group of visionaries with the power to "turn the whole tide of human thought." H.D. and Aldington attempted to salvage their relationship during this time, but he was suffering from the effects of his participation in the war, most likely Post Traumatic Stress Disorder, and they became estranged, living completely separate lives, but not divorcing until 1938. From 1920 on, her relationship with Bryher became closer and the pair traveled in Egypt, Greece and the United States before eventually settling in Switzerland. In the early 1920s, H.D. started to write three projected cycles of novels. The first of these, Magna Graeca, consisted of Palimpsest (1921) and Hedylus (1928). These novels use their classical settings to explore the poetic vocation, particularly as it applies to women in a patriarchal literary culture. The Madrigal cycle consisted of HERmione, Bid Me to Live, Paint It Today, and Asphodel. These novels are largely autobiographical and deal with the development of the female artist and the conflicts inherent in sexual desire. Possibly because of their closeness to H.D. 's own life and the lives of her friends and loved ones, most of H.D. 's fiction was not published until after her death. Kora and Ka and The Usual Star, two novellas from the Borderline cycle, were published in 1933. In the late 1920's H.D. and Bryher set up a magazine entitled Close Up and formed the POOL cinema group to write about and make films. Only one POOL film survives in its entirety, Borderline (1930), starring H.D. and Paul Robeson. In common with the Borderline novellas, the film explores extreme mental states and their relationship to surface reality. In addition to acting in this film, H.D. wrote explanatory pamphlet to accompany it, which was published in Close Up. In 1933, H.D. traveled to Vienna in order to undergo analysis with Sigmund Freud. She had long been interested in his ideas, which is evident from the pamphlet on Borderline as well as some of her earlier works. She was referred to him by Bryher's psychoanalyst because of her increasing paranoia about the approach of World War II. The first Great War had left her feeling shattered, and she was terrified that she would not be able to endure a similar conflict. She had lost her brother to the Great War, her husband suffered terribly from his combat experiences, and she believed that the onslaught of the war indirectly caused the death of her child with Aldington: She also believed it was her shock at hearing the news about the RMS Lusitania that directly caused her miscarriage. The rise of Adolf Hitler signaled that another war was inenvitable. H.D. found the prospect of this intolerable and it caused unbearable strain on her psyche. Writing on the Wall, H.D. 's memoir written about her analysis sessions with Freud, was written concurrently with Trilogy and published in 1944; in 1956, it was republished with Advent, a journal of the analysis, under the title Tribute to Freud. H.D. and Bryher spent the duration of World War II in London. During this time, H.D. wrote The Gift, a memoir of her childhood and family life in Bethlehem, Pennsylvania, which reflects on people and events in her background that helped shape her as a writer. The Gift was eventually published in 1982. She also wrote Trilogy, published as The Walls do not Fall (1944), Tribute to the Angels (1945), and The Flowering of the Rod (1946). This three-part poem on the experience of the blitz ranks with Pound's Pisan Cantos and T.S. Eliot's Little Gidding as a major modernist response to the war as seen from a civilian perspective. The poems also represent the first fruit of her new approach to writing poetry, with a much looser and more conversational tone and diction being used as well as a more inclusive approach to experience. The opening lines of The Walls do not Fall clearly and immediately signal H.D. 's break with her earlier Imagist poetic: "An incident here and there, / and rails gone (for guns) / from your (and my) old town square." After the war, H.D. and Bryher no longer lived together, but remained in contact. H. D. moved to Switzerland, where, in the spring of 1946, she suffered a severe mental breakdown which resulted in her staying in a clinic until the autumn of that year. Apart from a number of trips to the United States, H.D. spent the rest of her life in Switzerland. In the late 1950s, she underwent more treatment, this time with the psychoanalyst Erich Heydt. At Heydt's prompting, she wrote End to Torment, a memoir of her relationship with Pound, who allowed the poems of Hilda's Book to be included when the book was published. During this decade, she wrote a considerable amount of poetry, most notably Helen in Egypt (written 1952–54), a feminist deconstruction of male-centered epic poetry which uses Euripides's play Helen as a starting point for a reinterpretation of the basis of the Trojan War and, by extension, of war itself. This work has been seen by some critics, including Jeffrey Twitchell-Waas, as H.D. 's response to Pound's Cantos, a work she greatly admired. The other poems of this period are "Sagesse," "Winter Love," and "Hermetic Definition." These three were published posthumously with the collective title Hermetic Definition (1972). The poem "Hermetic Definition" takes as its starting points her love for a man 30 years her junior and the line, "so slow is the rose to open," from Pound's "Canto 106." "Sagesse," written in bed after H.D. had broken her hip in a fall, serves as a kind of coda to Trilogy, written partly in the voice of a young female Blitz survivor who finds herself living in fear of the atom bomb. "Winter Love" was written together with End to Torment, using as narrator the Homeric figure of Penelope to restate the material of the memoir in poetic form. At one time, H.D. considered appending this poem as a coda to Helen in Egypt. The rediscovery of H.D. 's work from the 1970s onward coincided with, and was assisted by, the emergence of a feminist literary criticism that found much to admire in the questioning of gender roles, and the powerfully imagined female characters that are so typical of her writings. Specifically, those critics who were working to challenge the standard view of English-language literary modernism, based on the work of such male writers as Pound, Eliot, and James Joyce, were able to restore H.D. to a more significant position in the history of the movement as one of its most significant female voices. Her writings also have served as a model for a number of more recent women poets working in the modernist tradition. Examples include the New York School poet Barbara Guest, the Anglo-American poet Denise Levertov and the L=A=N=G=U=A=G=E Poets of late twentieth century. Her influence is not limited to women poets. Many male writers, including Robert Duncan and Robert Creeley, have acknowledged their debt to her. H.D. 's peculiar style remains difficult for new readers, but beneath the apparent simplicity of her poetry lies a tremendous depth of meaning, hidden in the undertones and nuances of every carefully crafted phrase and meticulously constructed image. Like Pound, H.D. 's works mark a high-point for experimentation in English-language poetry, and she, perhaps more than any other poet of her time, was able to push the limits of what poetry could be. Chisholm, Dianne. H.D. 's Freudian Poetics: Psychoanalysis in Translation. Cornell University Press, 1992. Friedman, Susan Stanford. Psyche Reborn: The Emergence of H.D. Indiana University Press, 1981. Morris, Adalaide. How to Live / What to Do: H.D. 's Cultural Poetics. University of Illinois Press, 2003. H.D. at Modern American Poetry. This page was last modified on 24 December 2017, at 20:24.